The flowers you receive from your local florist, ordered here on Bloom Magic, will arrive fresh and full of life, but no doubt, you’ll want to extend their beauty for as long as possible. How you care for them after you receive them will play a huge role in this, and choosing the right kind of water is imperative in making sure they last a long time. Here’s a quick guide to help choose the best water when you order flowers online. Hard Water: Seriously hard water may contain a lot of calcium carbonate and calcium sulphate, which will impact how well the flowers can “drink.” Although it’s not as common, high concentrations of magnesium cause the same issue. Soft Water: Most water that is considered “soft” is made that way through adding salt. This is bad for your flowers as well. Fluoridated Water: Across Ireland, fluoride in the water is a hot topic, but for now, it is present in public water supplies. In small concentrations, it’s ok, but it’s very difficult to measure how much is in your water. If you’re trying to extend the life of your cut flowers, you may want to avoid any fluoridated water source, including the tap. If it’s feasible, and your rainwater is clean, you can collect it for your flower bouquets. Cool water as it falls from the clouds is arguably the best thing you can give your flowers- it’s what nature intended! However, you must change out the water every day so it stays fresh. Unfortunately, this means rainwater is not always a viable solution. 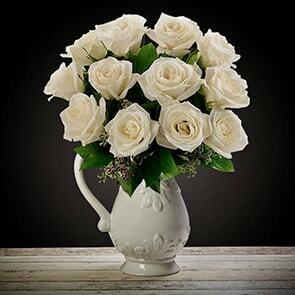 When tap water won’t do and rain water is scarce, bottled water is the best choice for your flowers. The only caveat to this is that you must select a brand that doesn’t add minerals into their product, as some do this to improve the taste. Calcium is one of the most common additives, though fluoride and salt often make their way into bottled water as well, so be sure to read the labels. Your local florist will likely send a packet of “food” along with your flower delivery. Using this is a tried and true way to extend the life of your bouquet. Of course, it’s always important to begin with fresh flowers, so that you can enjoy them longer. Bloom Magic are truly dedicated in this respect, and always make sure the breathtaking arrangements they deliver are created with the freshest flowers possible. To see what they have available to order today, check our catalogue and search by the location of the lucky recipient.